“Jerry – Finally got to try the Buffalo Chicken pizza last night, and I was impressed once again. Took awhile, but I’ve tried them all now, and didn’t find one I didn’t like. I’ve had several of the teachers in our school comment on them too. You have a great product! Keep it up! And thanks again for the fundraiser. Didn’t have one mislabeled box or any miscounts of pizzas…..just made for an absolute breeze during delivery. Pass my thanks and compliments on to your staff as well. At Giovanni’s Frozen Pizza, we offer distributors and commercial businesses the freshest and most delicious selection of frozen pizzas available. If you’re looking for a wholesale pizza that will impress your customers with its flavor, look no further than our company’s offerings. Giovanni’s Frozen Pizza is a family-owned business that has over 20 years of pizza-making experience. Through our top-quality ingredients, secret sauce recipe and variety of toppings, we’ll help you provide your customers with a mouthwatering dining experience. Our pizzas are so delicious and fresh that you won’t believe it was ever frozen! We work with a wide range of distributors and businesses to provide the highest quality wholesale pizza. Our business has over 20 years of experience in the pizza-making industry. We ship our frozen pizzas to seven states throughout the northern U.S.
Our pizzas can be customized to support your business needs and marketing message. We create delicious pizzas that taste so good you’ll never believe they were once frozen. 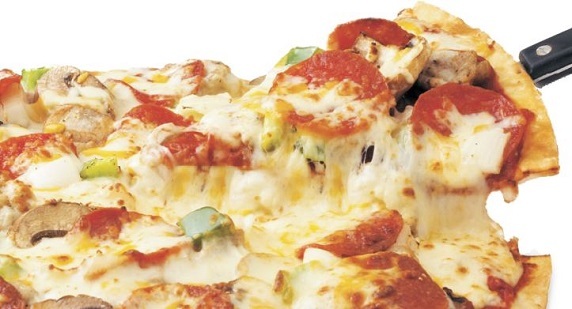 "These are the BEST frozen pizzas I have ever had! Please make them available at grocery stores! I am in Stillwater, MN and I checked our lo..."
"The Best Pizza!! My favorite one is the 4-meat, well maybe the pepperoni, well maybe the Cheese, or maybe it's the..... you get the idea, I..."
"This is by far my favorite. To me the sauce is everything, and this pizza has a sauce that I'm craving and I just finished eating it! Get ..."
August 4, 2017 David R.
"My wife & I love your pizza. Do you have a distributor close to Alexandria, MN?" "Love this pizza! It rocks I like to have them at Shep's during football games." We offer the freshest frozen pizza to our distributors in the following states, and growing!